Suzanne's Tribe: New Year, New Car, New Job! Well, the post title says it all. Things are still difficult with Ella and other stuff. But there's also good :) and anyone that reads this regularly knows that I won't be beat by whatever shite is thrown my way - and boy has a lot been thrown over the years! Before Christmas I went to several interviews, and the one I wanted most I got! I was surprised because, although I know I could do the job, and knew the information, I was so nervous at the interview I thought I had blown it! Apparently not. This time there's no insecure females above me, hopefully that means I'll be able to enjoy the role without all the office politics. So, of course I need a car because it's not easy to get to on public transport. Not impossible, but would add a lot of time to travelling. The last car I got to choose for me was the Mini when I was pregnant with Joseph - 27 years ago!! Every car since then has had to be practical to transport the children, teens, fosterlings, around. 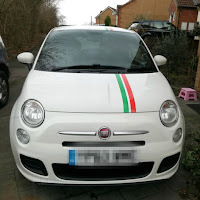 For the last few years I have loved the new Fiat 500 but couldn't justify buying one. 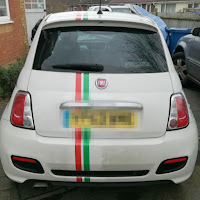 Now however things were different :) I wanted a traditional colour, red, white or green to go with the Italian flag. There are some lovely colours out there but I knew what I wanted. We went for white. The company, Chequers Cars, replaced the two front tyres, and the gear knob (can't have a broken knob hey?). 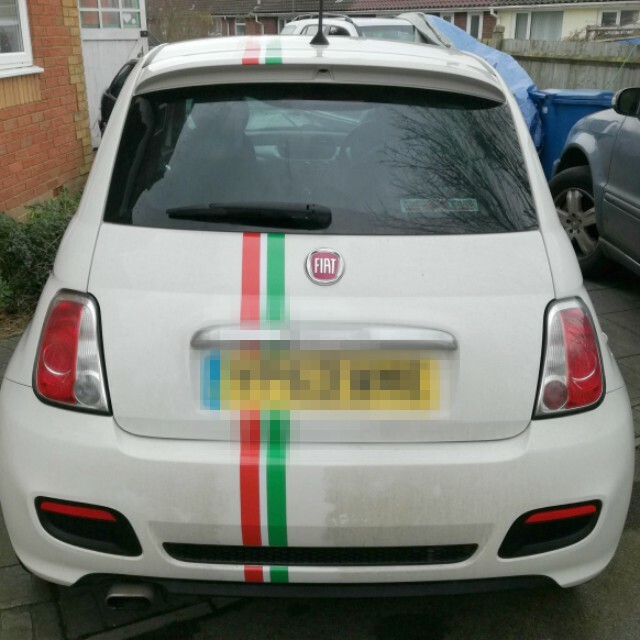 When we got it home Jeff went online, ordered the stripe, and added the Italian flag stripe along the length of the car. Say hello to my new car, I love her! It's so sad, but every time I see her in the car park I smile! Nice! The stripe adds a nice touch. Congratulations on the new car and job!!! That's a handsome car!!! Congratulations!